Robert M. Young's acclaimed 1977 drama will make a run for the Blu-ray border in April. 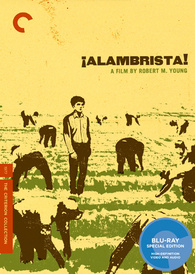 In an early announcement to retailers, Criterion has revealed '¡Alambrista!' will arrive on Blu-ray on April 17. Vivid and spare where other films about illegal immigration might sentimentalize, Young’s take on the subject is equal parts intimate character study and gripping road movie, a political work that never loses sight of the complex man at its center. The Blu-ray will feature a 1080p transfer, DTS-HD Master Audio 2.0 soundtrack, and supplements include: New audio commentary featuring director Robert M. Young and coproducer Michael Hausman; New interview with actor Edward James Olmos; Children of the Fields, a 1973 short documentary by Young - Accompanied by a new interview with the director; Trailer; and a booklet featuring an essay by film historian Charles Ramírez-Berg. You can find the latest specs for '¡Alambrista!' linked from our Blu-ray Release Schedule, where it's indexed under April 17.